Use at any of our ATM’s to get cash fast. We have ATM’s at every Liberty Bank location. Your purchases made with your MasterCard Debit Card come directly out of your checking account in real time. Introducing the MyPic Personalized Debit Card. See below for more details. 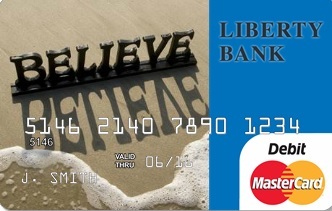 Liberty bank now provides the opportunity for you to create a personalized debit card that is as unique as you are! 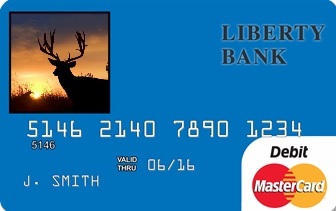 An existing Liberty Bank Debit MasterCard. Your new MyPic Debit Card will be issued with the same debit card number as your existing card. You can continue using your current debit card until your MyPic debit card arrives. Destroy your old card once you receive and activate your new MyPic card. If you have any recurring debit card payments on your existing card, you will need to contact the merchant with your new expiration date. 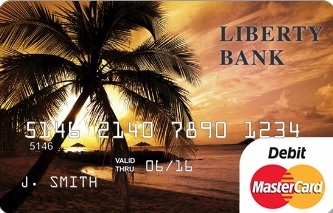 Contact your local branch if you do not already have a Liberty Bank Debit MasterCard. SHAZAM® MyPic Studio allows you to upload your favorite photo or choose from a variety of images in the gallery. Any photo submitted to SHAZAM® MyPic Studio must comply with the Image Guidelines.